Basseterre, St.Kitts, October 11, 2016 – A rainbow of colours rained downed on the capital recently as over 600 excited walkers hit the streets on Saturday October 8th 2016 in the 5th annual Walk for the Cure aimed at raising thousands of dollars across the region to aid in the fight against cancer. The walk, an initiative of CIBC First Caribbean International bank and held in the 16 other territories where the bank has a presence, brought together bank staff, family, friends and event sponsors who set out on the symbolic walk in a bid to raise awareness of and support for the fight against cancer. 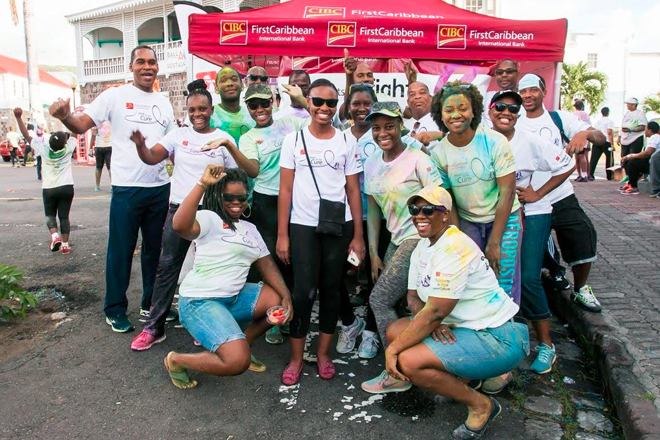 Participants literally painted the town pink, blue, gold and green as they showered themselves and each other with a kaleidoscope of colourful powder at various intervals along this year’s route – which took them from the main branch at the Circus unto to the Bay Road, along Frigate Bay Road, and back to the bank via Pond Road and West Independence Square where the event climaxed with light refreshments, fun and fellowship. Business Banking Officer Ladimer Gumbs said the bank was excited at the huge turnout. He said the funds collected from the walk would go to A Time 4 Us Foundation, which is responsible for establishing a cancer center in the Federation. Corporate partners for this year’s walk included: Gold Sponsor: Rams, Silver Sponsors: Royal Beach Casino, Kajola Kristada Limited, Mitchum and Benjamin Legal Chambers, Delta Petroleum, Grant Thornton and Bronze Sponsors: Liat, Sknvibes and Modern Elegance Photography. The walk was one of many similar events taking place during the month of October across 16 territories in the Caribbean and in Canada at the bank’s parent company which held it is annual Run for the Cure now in its 18th year.